This Shifting Gears report evaluates one of Canada’s most innovative integration schemes–the ongoing initiative in Ontario’s Peel Region–and identifies the possibilities and challenges presented by service integration; traces the factors driving governments towards human services reform; distils lessons and best practices from the change management strategies used in Peel Region; and examines the outcomes to date. The economic downturn has put human services under acute strain. Demand is rising at a time when budgets are being cut. This sustainability challenge is putting the viability of current service delivery models centre stage. Yet even prior to the onset of the financial crisis in 2008, governments were already recognizing that service delivery systems were failing. Costs were escalating, complex social problems were not being tackled effectively, and delivery methods were not meeting changing citizen expectations. The current fiscal situation has proved a clutch moment. Many jurisdictions are turning to service integration schemes in an attempt to improve provision while lowering costs. Integration is considered a means of generating administrative efficiencies through the consolidation of bureaucratic structures; offering clients the continuum of support they require to transition to independence; and boosting public trust in government by improving the quality of citizen interaction with services. The path to integrated service delivery is not easy. Potential obstacles, including labour relations, legacy systems, and entrenched working cultures, must be addressed. 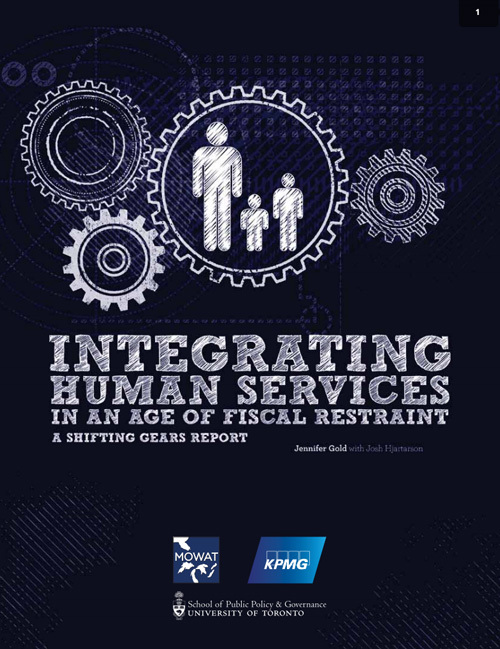 Policymakers have few in-depth studies of human services integration schemes at their disposal. Lessons and best practices are not routinely shared. This report makes a timely intervention. It offers the first in-depth evaluation of one of Canada’s largest integration schemes to date: the ongoing initiative in Ontario’s Peel Region in the Greater Toronto Area. The Region was an early mover and has been widely praised for its approach. This report brings together insights from interviews, focus groups, and internal documents. We listened to human services staff and community organizations and through these conversations have developed key lessons for other governments. Integrating services inevitably involves upfront costs and short-term upheaval for staff. Yet well-managed reforms can win employee support and enhance management legitimacy if transformation efforts are driven by an attractive vision of an improved outcome framed in terms of the public good. Minimal disruption to services, sustainable cost savings, more timely and accessible services, and better client outcomes are all achievable. Successful integration requires genuinely collaborative planning, from building an evidence base to developing and refining an integration blueprint on the basis of extensive consultation with frontline staff and stakeholders. This collaborative process will facilitate change readiness and the organization-wide mobilization of personnel. The composition of the integration leadership team must match the needs of the new operating environment. In addition to consideration of skill sets, competencies, and cross-program representation, it is vital that selection is also based on mindset and commitment to the new way of thinking. High turnover in senior positions is not necessarily a problem if it ensures that the right people with the right mentality are leading the project. Human resource (HR) professionals should be regarded as a key source of strategic advice rather than simply a provider of transactional services. HR specialists must be engaged with the planning and delivery process from the outset, preferably through membership on leadership or project management teams. Potential obstacles associated with labour relations and collective agreements will be far more effectively managed as a result, particularly if specialists are able to engage bargaining agents in the integration dialogue. Service integration can create new (albeit larger) siloed delivery units that do not work effectively with other government services and sectors. Routine consultation and formal partnerships with internal and external stakeholders will help avoid this outcome. The challenges involved in replacing legacy systems (e.g., program-specific IT systems) that were never designed to interact with each other should not be underestimated. Reforms will not outlast the immediate impetus of the integration program unless they become embedded in mindsets at an individual and institutional level. Training and communications should foster a sense of the common client whose needs cannot simply be compartmentalized into different program areas. Collaborative behaviour that supports integration and breaks down organizational silos should be incentivized through performance targets, staff appraisals, promotion opportunities, and public recognition (e.g., awards). Such behaviour should also be reviewed and monitored through culture audits. The development of feedback mechanisms is essential to successful implementation. Data collection and performance tracking procedures must be aligned with the performance indicators selected. This report is of particular value to Canada’s provincial and municipal governments. With direct responsibility for the delivery of services and less budget flexibility than the federal government, the reconfiguration of existing service delivery models offers one of the most effective ways of simultaneously improving outcomes and putting human services on a fiscally sustainable path.